Nothing captures the vibrant African vibe quite like Kente cloth. The history of African Kente cloth goes back to the 12th century, when these colorful fabrics were worn by African royalty. The name Kente comes from the word "kenten" (basket), because of the cloth's resemblance to a basket-woven design. Each Kente pattern is distinct and has its own special meaning. Many people around the globe are proudly wearing Kente cloth today to show their unique sense of fashion and their connection to the motherland. 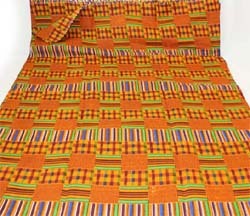 In addition to clothing, Kente cloth prints can be used to create crafts, decorations, throw rugs, table cloths, etc. Fabric produced in India.45" wide.